The Kingston Barn is situated in the village of Kingston which lies 5 miles to the South East of Canterbury in the county of Kent. Kingston is on the Eastern Edge of the North Downs in countryside designated an 'Area of Outstanding Natural Beauty'. The Barn has good heating, theatre style seating for 93, a licensed Bar, level access, adjacent free parking and disabled facilities. Used by the local and wider community as the village hall it is available to hire by all. Contact the booking secretary here to hire the venue. Directions from Canterbury - head South East on the A2 towards Dover. Approx 4 miles beyond Canterbury take the exit signposted Barham, Kingston, Bishopsbourne. Turn right under the A2 bridge. Turn left onto Bonnybush Hill signposted Kingston, Barham. Continue straight for threequarters of a mile. Turn right into The Street, Kingston, by a triangular grass island with a bus shelter in the middle. Continue along The Street for one fifth of a mile. The Barn is on the left hand side with the entrance into the car park just beyond. Directions from Dover - head North West on the A2 towards Canterbury. Approx 12 miles from Dover take the exit signposted Bish'bourne, Bridge, Kingston, Barham. At the end of the slip road turn left signposted Kingston and Barham. Continue straight along and down Bonny Bush Hill for just over half a mile. At the bottom of the hill turn right by the bus shelter into The Street, Kingston. Continue straight for one fifth of a mile. The Barn is on the left hand side with the entrance to the car park just beyond. Formally known as Canterbury Cathedral International Study Centre - but we agree 'Lodge' is slightly catchier! A unique, contemporary venue, situated in the grounds of Canterbury Cathedral, a UNESCO designated World Heritage Site, in the heart of the City of Canterbury, Kent. Seating 170 on the ground floor stalls and 30 in the balcony it is another beautiful space to share this music. Chris While claims it has the best acoustics in the land. It certainly has one of the most awesome backdrops, the majestic illuminated Cathedral. There are a number of public car parks fairly close by. The Quenin Gate is probably the closest, but beware the entrance through the wall is often closed after 7pm. The main entrance is via the Christchurch gate from the Buttermarket (by Starbucks) and follow the road around to the right. The Cathedral Lodge is on the right hand side, just beyond the exit which takes you through the Cathedral shop. The Venue is through the glass doors and turn right then left. They have accommodation on site for anyone wishing to stop over. St Gregory's Church, North Holmes Rd, Canterbury was built in 1851 to a George Gilbert Scott design, as a memorial to Archbishop William Howley. The church was made redundant in 1975 and is now owned by Canterbury Christ Church University College. used for music studies as 'The St Gregory's Centre'. It is a warm, welcoming and beautiful venue. In 2011 it had a major refurbishment which saw raked theatre seating installed and new decor, sound, lighting and facilities, but it remains intimate with superb natural acoustics. Easily accessible, level free parking right next to the venue, good facilities. Peter Knight (Gigspanner, Steeleye Span) said it was one of the best venues he had ever played. In the past we've hosted artists such as Steve Knightley, Chris Wood, Girlyman and Gigspanner. Directions - from the Canterbury ring-road - either direction - opposite the Cathedral Wall (Quenin Gate) car park turn down Lady Wootton's Green. At the roundabout take the first exit into Monastery Street. Turn right into Havelock Street, then right into North Holmes Road, the car park and entrance are almost directly on the left hand side. There is a bar at the venue and a lovely little pub - The New Inn, in Havelock Street just around the corner. Across the road from St Gregory's, (above) the University Chapel is another beautiful, atmospheric and contemporary space for live music. Enter through Gate 4 and there is free parking to the right inside the campus wall. The Lounge is the brand new Student Union’s Boston inspired bar, with a classy mix of leather, wood and rust effect steel giving a cross between a living room atmosphere and a Gentlemans Club. With an in house bar, restaurant and coffee shop, and equipped with state of the art PA/Lighting and moveable staging, we are very happy to include this in our varied list of Folk in the Barn venues and look forward to many memorable events there in the years to come. Centrally located, it's just a short walk from the bus station and just a little further to the railway stations with ample parking nearby - Holmans Meadow and Longport car parks probably the closest. A medieval church, renowned for its sense of space, St Mary's occupies what may be the oldest church site in Sandwich, where a 7th century convent was founded of which nothing now survives. Early documents belonging to the church date from 1311. These and the church registers dating from 1474 are kept in the Kent Archives. There remain substantial parts of a large Norman church, despite the town having been sacked by the French in the 13th and 15th centuries, an earthquake in the 16th and the collapse of the tower in the 17th. Sandwich St. Mary's Community Trust (SSMCT) was registered as a charity in 1997 and has made significant progress on improving facilities for the church's use as a venue for events. As a music venue - this place is superb, incredible natural acoustics, beautiful architectural backdrop, enormous stage, comfortable seating for 300 people (no pews!) and no pillars to block your view. A really magical venue. Accessible with a large level car park right opposite and a cosy pub/restaurant next door. Its very easy to find. From the Sandwich bypass A256, enter Sandwich on the Ash Road (A257) and continue forward for 0.8 of a mile - past a windmill on your left, over a level crossing, then you'll soon come across the church on the right hand side. The public car park is directly opposite on your left. Pay and Display. Whitstable is very fortunate to have its own theatre, The Playhouse, which is owned and managed by The Lindley Players Limited. The Lindley Players, first formed in 1946 by Ralph Lindley, performed in local church halls until eventually - in 1980 - they purchased the then United Reformed Church. A lot of hard work by the members over the next year converted the church into a theatre seating 182 We adore using this little theatre, it has such charm and atmosphere. All sumptuous red velvet and chandeliers, with proper stalls and a balcony - it's perfect and another wonderful characterful venue to host acoustic music of the highest calibre. 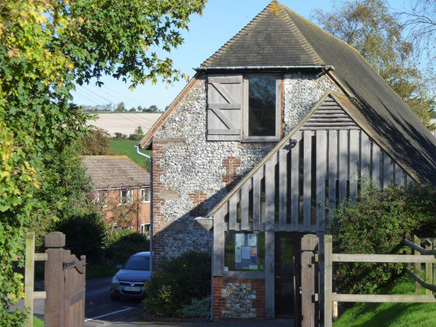 With a large but cosy bar downstairs, a vast public car park a very short walk at the back of the building and the loveliest team of people there to work with, we hope to continue Folk in the Barn at the Whitstable Playhouse for years to come. Our smallest venue and location for Folk in the Barn 'Even Cosier', our winter series every January and occasionally at other times too. We turn the back room of this characterful village pub into an exciting intimate venue, with theatre style seating for 55, full PA and dramatic lighting. Some of our favourite concerts have been held here. Due to it's size it nearly always sells out and there is always a great atmosphere. Village lads Tom Wakefield (host) and Ben Lavers (chef) have done a great job re-instating this popular Inn after it was devastated by flooding 2 years ago. The food is great, you can book a meal in the bar for before the show, sometimes people save their pud and coffee for the interval. A short drive from the Kingston Barn. From Canterbury direction, instead of turning up into The Street, Kingston, continue on as if going towards Barham, just around the first bend is the Black Robin Inn, on the right hand side. Car park right next door. First used by us in 2015 for Megson as an alternative to the Barn, St Johns is Barham's beautiful village church, just a short drive along the valley from the Kingston Barn and Black Robin. Fully modernised inside with new upholstered - very comfy seating. We put in a stage (sideways on) and full PA and lights to turn this into a spectacular venue with great natural acoustics for this music. Yes there's a bar - and even a new loo! Parking is on the lane next to the church, please park neatly to allow everybody a space. If completely full, continue down The Street and park here or in Valley Road. Opened in Spring 2016, Barham's beautifully refurbished Village Hall is now a contemporary but still warm and welcoming space. A campaign by villages and committee saw the old, tired but much loved Hall closed for a major re-development including attached community store and extended space and facilities. It's now virtually unrecognisable from before and a very worthy addition to our growing list of beautiful venues for beautiful music. With a car park attached and extra parking on the safe, wide, well-lit street, beautiful new loos, kitchens and comfy new seating, I think everyone will enjoy coming to a concert here. Revelation St Mary's is Ashford's music and arts venue, delivered by the St Mary's Arts Trust. Since 2011, they have worked hard to establish a centre of excellence for the arts in the town. Another beautiful and atmospheric performance space created from what was (and still is) the towns main place of worship, located in it's characterful and tranquil precincts, right in the town centre. Retaining all the original features such as the Georgian balcony, but with state of the art facilities and new flexible seating (top tiip -bring a cushion). Train - Ashford International, 10 minute walk from the station. Car - St Mary’s in Ashford Town Centre is just off of the M20 motorway (Junction 9), 10 minutes from the Channel Tunnel, 20 minutes from Dover, 38 miles from the M25 and just 1 hour from London. The Gulbenkian theatre based at the University of Kent, is a warm, vibrant and buzzing theatre and arts centre. I first attended the Gulbenkian back in 1979 on a school trip to see 'Oh What A Lovely War' and remember thinking what an unusual but perfectly shaped auditorium it was. Little did I know that 35 years later we'd be enjoying a great working relationship with the team at the theatre. At 340 capacity, the venue is suitable for our larger acts such as Fairport Convention, Dougie MacLean, Cara Dillon, Turin Brakes and Show of Hands. Easy, level, adjacent parking, a superb cinema and cafe-bar (with delicious coffee and cakes) but best of all a wonderful support team who are all so professional, friendly and helpful, we love working with them. This lovely characterful venue was introduced to us at a chance visit to Goodnestone Park's Christmas Fair. The Fitzwalter Room used to be the cowshed and is set in the grounds of beautiful Goodnestone Park, accessed through the quaint village of the same name. If you haven't been, the house and gardens are worth a visit in their own right. With an open beamed vaulted ceiling and spacious rustic foyer / reception area, it's been beautifully converted and is now used for wedding receptions, fayres and other functions. Goodnestone is a village and civil parish in the Dover district of Kent, England. The village is situated approximately 7 miles east-southeast from the city of Canterbury, and 5 miles west-southwest from Sandwich. The simplest access to the village is from the Wingham - Barham road, turn down Crockshard Lane by Gibsons (formerly Crockshards) farm shop then keep turning right. Go past the pub (Fitzwalter Arms on your right) and park when the road runs out. Waterstones the bookshop have been hosting an excellent programme of literary events in their top floor performance space for many years. Interested to expand their repertoire they contacted us about using the space as an alternative city centre venue for acoustic music. Surrounded by words and stories we think this will make an intriguing and inspirational, intimate performance space. There are many car parks nearby, the nearest being Whitefriars multi-storey or Watling Street. Access - there is a lift to the top floor and as usual we will have a licensed bar.